First of all sorry for disappearing for so long, I think I have never not blogged for this long since I started blogging. 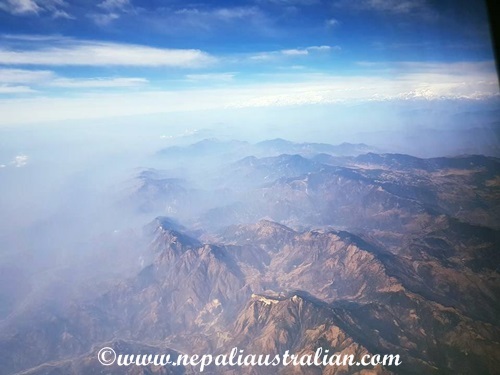 We went on a holiday to Malaysia and Nepal and somehow I was so busy that even though I drafted a few posts, didn’t have time to publish them. But now that I am back, I will write all about our trip and Chhori’s special birthday celebration in Nepal. But let me first share my experience in general about our travel with Chhori. As I have mentioned in my posts before, I was bit nervous about such a long flight with Chhori. 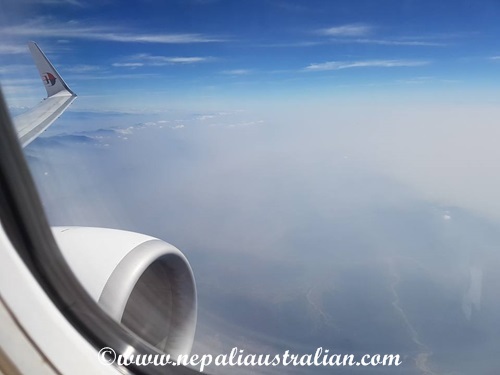 Even though Chhori has been on a plane before, the longest she has travelled is around 4 hours and she was great on that but it is a different story when it came to travelling to Nepal. First of all, we had to be on two different planes with a total time of 14+ hours and on top of that as she was under 2 years old and we didn’t have a separate seat for her. We flew from Sydney to Malaysia during the day and that 9 hour flight was the worst of the entire trip. As it was day time, Chhori slept for only an hour and the rest of the time we had to entertain her. We had a tablet full of movies and rhymes for her and also a lot of snacks but it was a very hard job. She was OK for the first few hours and then she started getting bored. She would move from my seat to AS’s and we had to try our best to make sure she was busy so she wouldn’t cry. At one stage, she wanted the whole seat to herself so she evicted me from my seat and I ended up on the floor in from of the seat. AS couldn’t stop laughing and luckily as we were allocated seats with good leg room I had room to sit on the floor. Chhori also played peekaboo with a couple behind our seat. She would stand up and say “boo” and sit down again. I hope they were amused and not annoyed. In Malaysia, she was great as we went to different tourist spots every day and she enjoyed the new environment. She loved the fact that she didn’t have to sit on a baby seat in the car anymore and she enjoyed the freedom. Above all she enjoyed the fact that mummy and daddy were with her 24/7. The flight from KL to Kathmandu was better as it was only 4 hours and she was OK most of the way. The worst part was when we landed and we had to wait for immigration and customs and the airport was bit chaotic. Chhori is only 2 years old but I know for sure that she loved Nepal. In Kathmandu, we spent most of our time in AS’s home and she loved it there as she had her grandparents, uncles and aunt and cousin to play with her. Every morning when she woke up, she wanted to go to the living area straight away because she knew there will be someone to play with her. She really enjoyed the company of her relatives and was really happy to play with her cousin. We took Chhori to visit many of our relatives and she did really well. She was social and affectionate and very well behaved most of the time. She really made us very proud. I am sure she would have been very happy to stay longer in Kathmandu but our holiday ended shortly after we celebrated her birthday and it was time for us to come back. I was a bit worried about our flight back but luckily for us, it was better than the journey to Nepal. 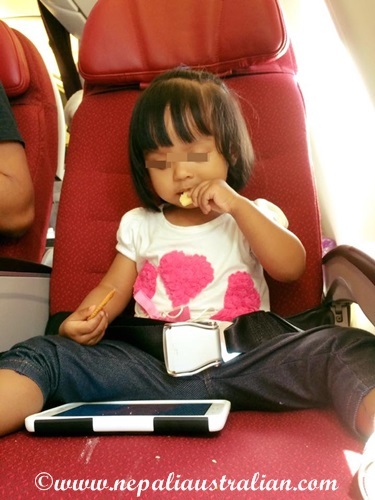 On our flight from Kathmandu to Malaysia, we had an empty seat next to us so Chhori was happy to have her own seat. It did make our journey less stressful. From Malaysia to Sydney, we got a bassinet for her and she slept most of the flight even though she was a bit big for it. I was happy to have a peacefully sleeping baby which allowed me to rest and eat my meal without worrying too much. I was so happy when we landed in Sydney because even though I loved our trip, the flight there and back was bit tough. 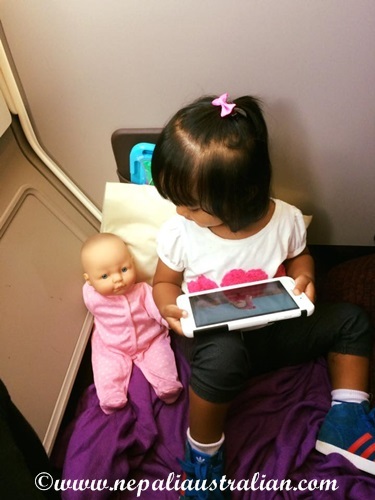 I think if a child is over a year old and it is a long flight, it is a good idea to buy an extra seat for the child as it will be really helpful and gives you a bit more flexibility. 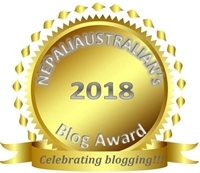 This entry was posted in Being Mum, Holidays, Nepal, Nepal 2017, Our daughter, Travel and tagged australian, australian nepali, chhori, daughter, going home, grandparents, kathmandu, M from nepaliaustralian, mum, Nepal, Nepalese, Nepali, nepali australian, Nepali blog, Nepaliaustralian, toddler, toddler travel, worried mum. Bookmark the permalink. Travelling with the baby is hard particularly after they start to walk. I had a hard time when I travelled from India to perth. Chorri looks so cute in the pics. Thank you so much. You are so right because I know when Chhori was small she will happily stay on our lap for hours but as soon as she stated walking, all she wants to do is run around. Happy birthday to ur chori d cute baby.i m too fond of traveling.wonderful journey. I’m nervous about flying with young kids! Your tips calm me thanks!